Throwback to last summer! Here's an outfit I never posted (except for the last photo). I ordered some merch from Black Moral when the GazettE's scene 02 aka Pulse Wriggling To Dim Scene -tour started. 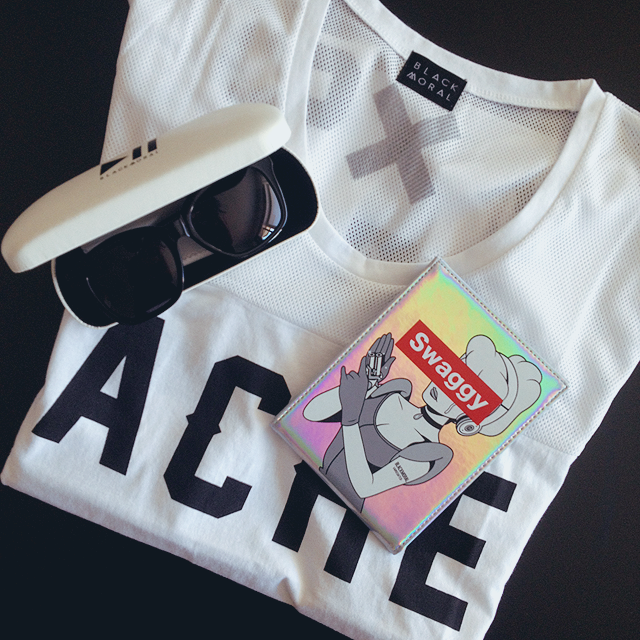 The items I picked were the white version of the t-shirt, a mirror and sunglasses! I was afraid they wouldn't arrive on time before I would leave to Japan, but luckily I got them a few days before my flight. Anyway, this outfit also ended up being what I wore for the first two gigs. Except for the shoes, I didn't bring those white platforms to Japan with me. They would've been quite dangerous too because the gigs tend to get kinda crazy, so I chose to wear regular black boots instead. What I really like about the GazettE's merch, is that it doesn't scream the band's name. It looks like something I would normally wear, but is recognizable to those who are also fans of the band. That's the best way I think, every other tour t-shirt I've ever bought, has ended up serving it's purpose as a pyjama or not even that. The sunglasses were the most expensive ones from this bunch, but I don't regret buying them at all, since the quality is really good and not just some cheap plastic. I love collecting different glasses and sunglasses and I was missing this kind of basic looking pair, so they are a great addition to my collection! Ah, looking at these pictures is making me miss summer so so much. You look awesome! I have so much respect when you wear bright colored or white cloth. I always feel strange when I do, but you make your own matching coords! 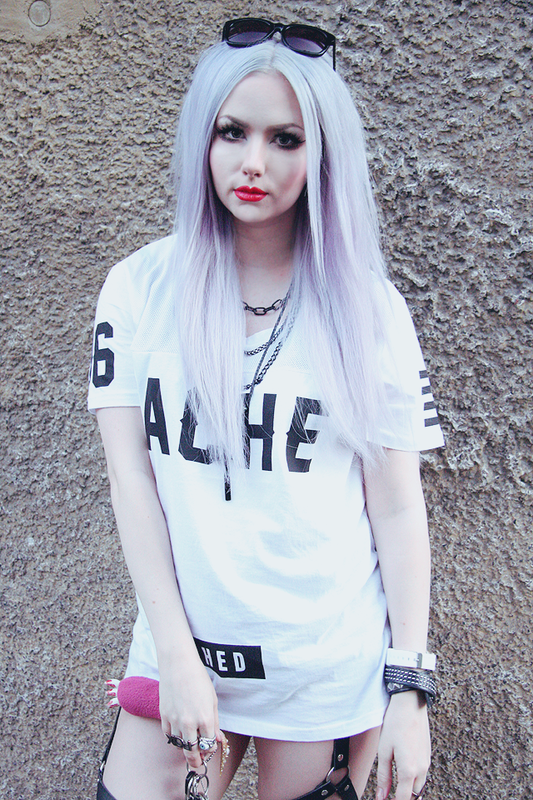 i actually enjoy all-white outfits a lot, but bright colors are much harder :D black is always safe, hahaha. oohhh so cool outfit *-* you look wonderful! Sulle sopii kaikki valkonen niin älyttömän hyvin! Mua niin vituttaa, kun en tajunnut heti ostaa tota valkoista paitaa ja nyt se on tietty sold out </3 Voi elämä miks teet tän aina mulle yhyy! Ps. En tiiä, mitä bloggeri sääsi äsken et tuliko tää mun kommentti kaks kertaa mut whatever! kiitti!<3 oon kyl ilonen et tajusin ostaa tän netistä, koska keikoilla ei myyty kun pelkästään mustaa versiota ja muita heresy only kamoja :( peili on ainakin tähän mennessä kestäny hyvin, paitsi että hologrammimatskusta on kulmista kulunu väri. samoin ku samasta matskusta olevasta avaimenperästä on kulunu kaikki tekstejä myöten... XD mut hieno se kyl on! I honestly thought the top was by UNIF before reading your post! i know right? it looks like it could be from unif as well :D but i wouldn't be surprised if ruki has taken some inspiration from unif since i know he likes them too haha. Totally hot, love this look. 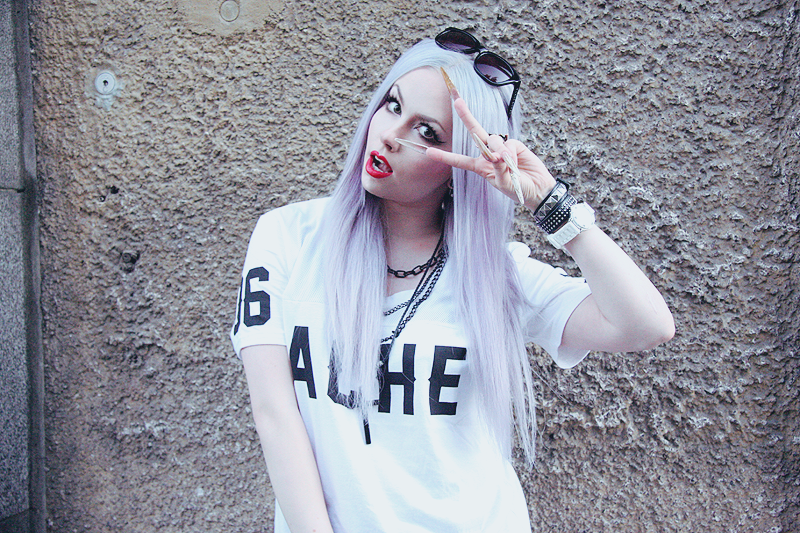 Cool outfit (your style in general *-*) I really love your shorts!